1508: AHCO along with East End, dispatched to area of 515 for a Motor vehicle Accident, no injuries, fluids down. AHCO responded with a crew to secure fluids and cleanup. 1333: AHCO along with East End Fire, Tamaqua rescue and Tamaqua EMS. Motor Vehicle Accident with unknown injuries, location update, near Sisters restaurant. Call then updated to Motor Vehicle Accident with Entrapment, vehicle over embankment. AHCO responded to assist with patient extrication. One patient flown from the scene. 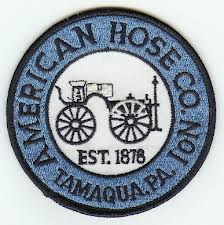 1635: Tamaqua Fire Department dispatched to Tamaqua High School for an Automatic Fire Alarm. Call back from school, accidental trip of the alarm from a baseball.